Steve Williams is struggling with a hamstring problem. Lancaster City must cut out their costly errors in their bid to get back to winning ways according to assistant manager Dave McCann. The Dolly Blues were put to the sword in the second half as they went down 5-2 at struggling Stalybridge Celtic on New Year’s Day to make it back-to-back defeats in the Evo-Stik Premier Division. Lancaster City assistant boss Dave McCann. The 1-0 reverse at home to Hednesford Town on Saturday was disappointing with the heavy defeat in their first game of 2018 more alarming. Next up is a trip to Whitby Town with Phil Brown’s number two knowing an improvement is needed from a City side who have been up and down in recent weeks. 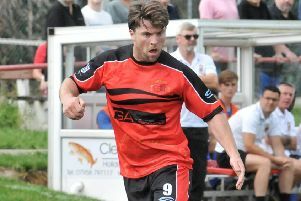 “We started the Christmas period well with the win over Mickleover and the point against Workington,” said McCann. “It’s gone a bit sour though with the last two results. “The players have worked extremely hard and we can’t fault the work rate but we’re being punished for our errors. “On New Year’s Day every error in the second half seemed to lead to a goal. “Maybe it’s one of those where after making the error the player will realise how important they are and not make them again. “They’ve just got to learn from their mistakes. Despite shipping five goals in the Stalybridge defeat, McCann insists the finger isn’t just being pointed at the Dolly Blues defence with things needing to be tightened up further forwards as well. “It’s happening in a few areas and in key moments of the game,” said the City assistant. “It’s not just the defence, it can be going forwards too. “Sometimes errors in attack are setting up attacks for the opposition. The main thing for the Lancaster management is that they see a response from their players in North Yorkshire with Whitby in 19th in the table, five points and six places behind the Dolly Blues as things stand. The hosts go into the game in good spirits after their 3-1 win on New Year’s Day ended Workington’s 17-game unbeaten run. “We’ve got a determined and focused group,” McCann said. “We’re hoping to see a reaction and we’ll need a positive one if we’re going to get a result. “Whitby had a good win on New Year’s Day when they ended Workington’s long unbeaten run so we know they’re not to be underestimated. The Dolly Blues are set to be without defender-turned-striker Steve Williams who is struggling with a hamstring problem that could keep him out for a couple of weeks. City are working on strengthening their squad and could have one or two new faces in their ranks for the trip to the Turnbull Ground on Saturday.